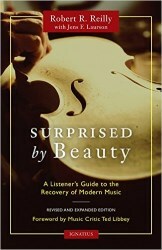 Despite a too-insistent negativity towards the atonality of Schoenberg and his ilk, even pursued to the end in an article ‘Recovering the Sacred in Music’ within this book’s concluding pages, this is an invaluable guide to modern approachable, even melodic tonal music. The book comes like a breath of fresh air after so many 20th century decades of avant-garde music or noise that - with its shades of the Emperor’s Clothes? - has appealed to only a minority. As an aside it is interesting to note that during the barren years it seemed that the only music that held the torch for tonality was film music especially in the 1930s-50s with scores from such composers as Max Steiner, Korngold, Waxman, Tiomkin and Rózsa. Now, as tonality is welcomed back into serious music, it appears that modern film scores fall very far short of the Late-Romantic music appeal of the aforementioned composers. In fact this sad situation closed down our sister site Film Music on the Web. The music of over sixty composers (see end of review for list) - some very well-known, some familiar, or vaguely familiar and others perhaps relatively unknown - is discussed, and at the end of each essay, some recommended recordings are given. While I already know some works by most of the composers included, I have been drawn to explore more of the output of some, based on this book’s recommendations; I have placed an asterisk against those names in the list below. In passing, last year I ‘discovered’ David Matthews when I reviewed a fascinating new SOMM release of his music. Thanks to this book I look forward to acquainting myself with much more of his music. Before all this there is the other ‘bookend’ article entitled, Is Music Sacred? in which the beneficence of tonality is traced back to ancient Greece and to the basis and ‘language’ of religion – although pantheists might argue that their beliefs were not unsupported by musical utterances? The book concludes with Reilly’s interesting and acerbic interview with Robert Craft, Stravinsky’s musical assistant and confidant, about Stravinsky and Schoenberg, together regarded in this context as ‘The Musical Antipodes of the Twentieth Century’. A list of recommended Schoenberg recordings is included at the end. Five tribute articles round off the tome - to: David Diamond, Gian Carlo Menotti, Einojuhani Rautavaara, George Rochberg and Carl Rütti. Clearly each reader will inevitably quarrel with the inclusion of some of the composers, and, probably more so, with omissions. Personally, I would have liked to have seen Frederick Delius included. Delius was often very much misunderstood and only thought of as a composer of small miniatures with no real sense of form. Such compositions as Appalachia or Paris or A Song of the High Hills are often unknown, ignored or unappreciated. Then there is the Swedish composer Kurt Atterberg whose music is very melodic in the heroic Late Romantic tradition and extraordinarily evocative – listen for example to his Third Symphony ‘West Coast Pictures’. Considering the number of American composers selected, I was surprised to notice the omission, unless I am very much mistaken of Nicolas Flagello and Arnold Rosner. I could go on and on. I was not impressed either with Reilly’s lofty, heavy-handed attitude towards film music. He lauds the scores of Korngold as ground-breaking - ‘… he revolutionised the trade and established standards still valid today …’ Not strictly true. It was Max Steiner who established the Late Romantic/Wagnerian leitmotif-based film score. He was to set the pattern for all later film music in his big-scale King Kong score for a large orchestra back in 1933. Despite my carps, this is a fascinating and very useful volume. I know I will refer to it often.